Morman Tea (also called Joint-Fir) is a member of the Ephedra family. 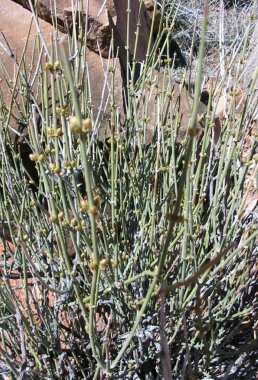 It appears as a shrub from 2 to 5 feet in height with green, jointed, leafless stems. The plant is actually a primitive conifer & bears papery cones after flowering. The plant grows in desert and grassland areas below 4500 feet in elevation. In February or March it produces tiny pale yellow flowers which grow in dense conelike clusters. Mormon settlers made a bitter tea from the dried stems of this plant. Q: Why would anyone want to drink a bad tasting tea? A: Because the stems contain caffeine and ephedrine.